After I retired from primary school teaching and tutoring University students in teacher training, I was very keen to keep active and not vegetate! When my husband and I had both retired from our part-time work nearly four years ago. We searched for something to participate in that interested us and we could do together. We have always enjoyed dancing and outdoor activities such as long walks and our gardening – we have a large garden. By chance a leaflet from Saracens was put through our door advertising the Sports Foundation Programme which included the times of sessions for Love to Dance. So we decided to give it a go and try the taster session. We thoroughly enjoyed the session, meeting new people and being immediately invited to the Christmas party which was six weeks away! Needless to say the rest is history – we have rarely missed a dance session since! We love the great variety of music and dance routines that we do. We have also participated in activities we could never expect to do – dance in Wembley Stadium and the London Stadium! During one of the dance sessions we were told of the Nordic Walking sessions and were encouraged by a couple of dancers, who also walked, to do a taster session, which we subsequently did. 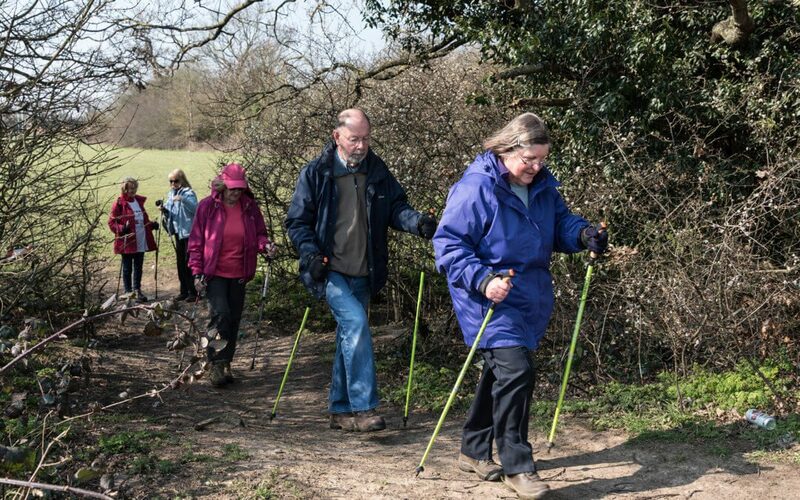 As we had enjoyed the taster session, we then did the month’s training for Nordic Walking. I must say initially I found Nordic Walking difficult as even though I thought I was fit, I found that I needed the stamina to walk for longer than a few minutes. Our Instructor was incredibly supportive and adapted the walking pace to mine and others’ needs throughout the weeks. Walking around our local area in all weathers and all seasons certainly keeps us in touch with and appreciate our environment. Recently we did a refresher skills session and I was chuffed with the feedback of how much I had improved. I know I’ve got the stamina now as I managed to walk for eight miles in a charity walk. As a result of dancing and walking each week, we are both much fitter than when we were working! We thoroughly enjoy the camaraderie of both groups as well as the coffee breaks and occasional meals together to catch up on the gossip and news! Late last year my husband was rushed to hospital for emergency major surgery and the support of both the dancing and walking groups during that time was fantastic. The doctors were impressed with my husband’s fitness and predicted that he would recover very quickly, which he did! He is now back enjoying the dance and walking sessions once again. On a final note: our daughter knows never to ask us to babysit our grandson on a Monday morning or a Thursday morning as the answer will be a resounding No!